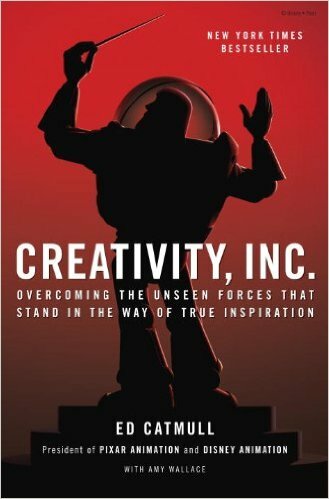 When I saw that a history of Pixar Animation was being published I was so excited to read it, but my excitement was dampened somewhat what I realized that above all else, this book was attempting to be a guide to leadership along the lines of How to make Friends and Influence People. My fears however were unfounded. While Catmull is definitely intending to provide managers of businesses with sound advice, he does so by talking about past projects he’s worked on at Pixar, both the failures and the massive successes. The innovations that company has introduced, things like the BrainTrust meetings, (essentially a brainstorming session where everyone involved in the project is included), are spoken about as tools that can be implemented in any workspace, although it is clear that Pixar is still a special company. Any company that employs so many creative people will have to come up with outside-of-the-box ways to manage them and funnel that creativity into the final projects that we have grown to love and cherish; Toy Story, Monsters Inc, Up, and the most recent iteration, Inside Out. Through all these movies, the story remains key and it is really interesting to read how some movies like Up started with an entirely different plot, then watching all the twists and turns that took place along the way before arriving at what we watch on the big screen. This isn’t a traditional history of the company or of Disney animation, and it will most likely be found under the “Business” section of bookstores. This shouldn’t deter you though, anyone who has ever cried or fallen in love with any one of Pixar’s movies will find the tale told between these pages to be charming and insightful. This entry was posted in Reviews and tagged Animation, Braintrust, Business, Create, Creativity Inc, Disney, Ed Catmull, How To, Leadership, Non Fiction, Pixar, Review, Steve Jobs, Toy Story, Up on September 7, 2015 by kwils3.